Full Grain 8 oz. Black cowhide leather case, complete with end pocket. This leather is dyed through, and will not crack. The leather is "vegetable tanned": a process which does not include Chromium or other "environmentally unfriendly" products. Quality Nylon thread is used to provide years of service. 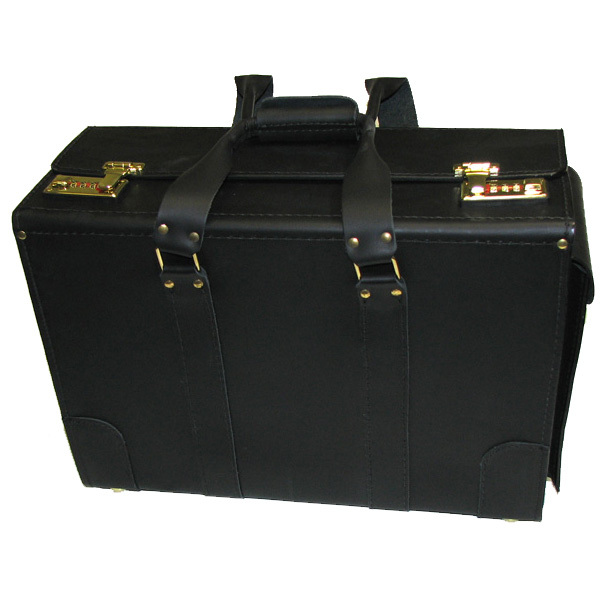 Double combination locks and covered metal handles are securely fastened to the case. One interior expandable divider and 'Easi-Clean' lining make this a versatile functional investment. Other interior features include a business card holder, and a larger pocket for pens etc. Exterior is: 18" X 8" X 12", plus available end pocket. There are no piano hinges to bend or break or restrict opening.